Join us at The Cause Church as we celebrate the Resurrection of Jesus Christ! We’d love for you to experience our Good Friday Service, as well as one of our five Easter Services on Saturday and Sunday. Join us as we hike to the top of a local hill and spend time worshiping God, taking communion and praying over our city. Maps available at The Connection Center. Experience the “Breath of Life” production. It’s a unique telling of Jesus’ death and resurrection, as we follow the Breath of the Holy Spirit, beginning with God first breathing into Adam and ending with Jesus’ last Breath on the Cross. Join us for powerful celebration services with a fun GLOW-In-The-Dark Easter Egg Hunt for children during the Service. Join us for an outdoor service on our parking lot as the sun rises. Bring a jacket and blanket or sit under a space heater to keep warm. Stay afterwards for a breakfast burrito. Se proveerá traduccion en español a los 5pm y 11am servicios. You will notice parking attendants that will direct you to a parking spot. We’re located in an industrial complex so we want to make your parking experience as easy as possible. Please be considerate of our neighbors as you pull forward into the spot. We have golf carts that will give you a ride up to the church entrance. Hop on and hold on tight as the cart whisks you away. Feel free to ask the driver to sing you a song or tell you a joke – they love to do that. No tips are necessary. You will be welcomed by our friendly Greeters as you approach the doors. They will hand you an Easter info card. There’s a coffee bar outside (as weather permits). Please feel free to grab a tea or coffee, and if you’d like to bring it into the Sanctuary during service, just make sure you have a lid on it. 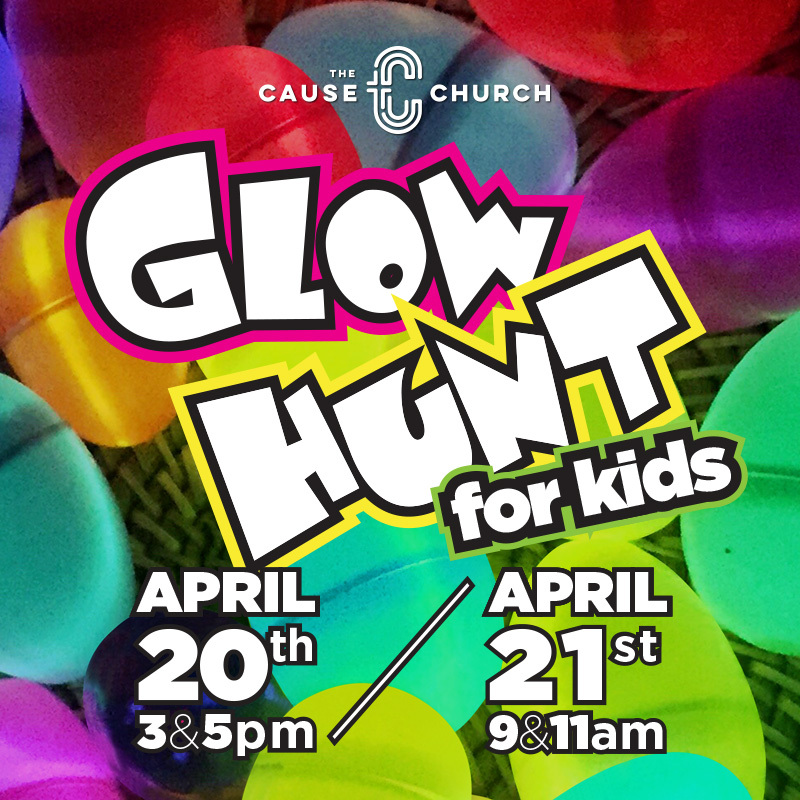 If you have children and would like to put them in the “Cause Kids” Children’s Ministry for the amazing GLOW Hunt, ask one of the Greeters to walk with you to the Children’s Check-In area where a friendly volunteer will guide you from there. If you have teenagers, during the 5pm service (and 5pm only) we have The Movement Junior High and High School Ministry. This is held in the Auditorium. But, because of Easter, your teenagers will enjoy the service with you in the Sanctuary. Our service has contemporary praise and worship, and a light-hearted, warm feel. We love to sing, but you are always welcome to just observe. After a few songs, a pastor will get up and pray or share an encouraging word, and sometimes will ask you to greet the people around you before taking a seat. After some announcements and our time of giving (there’s no pressure to put anything in the offering…please just don’t pull anything out! ), Pastor Bob will get straight into the message. We like to laugh and have fun in church (who said church had to be boring anyway?!). There is always opportunity to receive prayer at the end of service for any needs. Our services go for approximately an hour and fifteen minutes. Pastors Bob & Sherry have a passion to see people healthy, whole, and free, and you will find that their messages are practical, applicable, and relevant. *The child must be checked-in and stay in the Cause Kids service. **Parents – Even though you’d like to participate in the GLOW Hunt unfortunately because of safety considerations that is NOT an option. We do have a great Easter service for you and if you ask nicely we probably can give you some candy. GLOW Hunt will happen during the services listed above. Don’t worry about the daylight – we’ve got things covered (literally). The GLOW Hunt will be just as awesome during the day as it is at night because it is completely indoors. Kids will enjoy the whole Cause Kids Easter service and are encouraged to bring friends with them!